Following a rare firmware update for the AirPort Express, AirPort Extreme, and AirPort Time Capsule earlier this week, a few readers have contacted us about the Wi-Fi base stations being out of stock at their local Apple retail stores in the United States. Specifically, the tipsters informed us that the AirPort Extreme was out of stock at the Apple Store, Sagemore location in Marlton, New Jersey, an outer suburb of Philadelphia, and the Apple Store, Beverly Center location in Los Angeles, California. "I was trying to buy an AirPort Extreme today from the Beverly Hills Apple Store and an employee told me that Apple had asked for all of them back from all the stores," wrote one anonymous tipster. To verify the tipster's claim, we contacted an Apple support representative who confirmed that Apple has pulled AirPort Extreme and AirPort Time Capsule stock from all U.S. stores. The base stations remain available to order online, while it appears the smaller AirPort Express can still be purchased both online and in stores at present time. Apple's web-based Personal Pickup tool has also been removed from the AirPort Extreme and Time Capsule product pages on its U.S. storefront. Even though Apple has pulled all AirPort Extreme and Time Capsule stock from U.S. stores, it is possible that select locations may still some units available. The base stations also remain on sale through authorized resellers such as Best Buy. 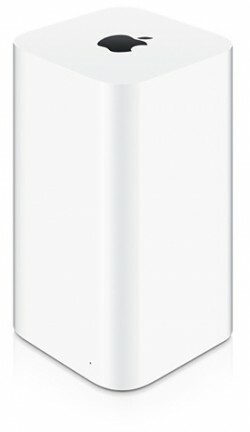 A retail source informed us that the AirPort Extreme and AirPort Time Capsule remain in stock at stores in the U.K., as confirmed by Personal Pickup, and the Wi-Fi base stations are also currently available at most stores in Australia, Canada, and Europe, so the in-store outage appears to be limited to U.S. stores for now. With WWDC 2016 around the corner, scarce availability of the AirPort Extreme and Time Capsule in the U.S. will naturally stir speculation about a possible refresh to its Wi-Fi base station lineup. However, the stock outage could be related to the recent firmware update, Apple Store renovations, or regular fluctuations within Apple's inventory channels. There are also no rumors about an impending AirPort refresh. Apple last updated the AirPort Extreme and AirPort Time Capsule at WWDC 2013 with faster 802.11ac Wi-Fi, new designs, and other internal changes. The slimmer AirPort Express was last updated in June 2012, drawing on the design of the Apple TV and gaining simultaneous dual-band 802.11n connectivity. Given the lack of rumors, it is unknown what features a next-generation AirPort Extreme could have, but 802.11ac wave 2 Wi-Fi is a possibility. Some readers also speculate that Apple could integrate Siri features into the AirPort Extreme amid rumors it is working on an Amazon Echo competitor -- which could also be a new Apple TV. Apple's AirPort base stations are designed to create or expand Wi-Fi networks, providing dual-band connectivity in addition to other features like music playback, wireless printing, and wireless backups. Read our AirPort roundup to learn more. Update: Apple may be complying with an FCC deadline of June 2, 2016 related to router software security rules gradually phased in since 2014, which would explain why the stock outage is limited to U.S. stores. "Starting June 2, 2016, permissive changes will not be permitted for devices approved under the old rules, unless they meet the requirements of the new rules," the FCC writes. "All devices partially or completely approved under the old rules cannot be marketed starting June 2, 2016 unless they meet the requirements of the new rules in all the bands of operation." Update 6/2: Apple's AirPort base stations are once again available for Personal Pickup and are in stock at most retail locations in the United States, suggesting the stock shortage was a temporary blip that has now been resolved. It probably has more to do with the fact that there is a new FCC rule going into effect on June 2 that requires router manufacturers to lock down their firmware and prevent users from disabling dynamic frequency selection (DFS). Get out of here with your logic. I want more outlandish speculation. Jony wants a thinner version. this thing desperately needs an upgrade. Waiting on 5400 rpm hds. I couldn't care less about Siri integration into a router. My router sits in the office/spare bedroom in the center of my house. We're only in there to use the iMac for school work, paying bills, etc. The majority of the time, I just want my time Capsule backing up files reliably and being a strong, reliable router for our multiple iPhones, iPads, Kindles, wireless printer, etc. Siri plays no part in this. I was extremely surprised to see when I checked Airport Utility that it was a firmware update. It had been so long since a firmware update was available, that when I saw the blinking yellow light I immediately assumed a hardware failure or anomalous double NAT message. Has anyone considered that they may simply discontinue them? There are tons of routers that offer better speed and better coverage - it's not like this is an outstanding product. Actually, it is an outstanding product. I've had my Airport router for years and have never had any problems with it ever. I don't even have to reboot it. Every other router I have ever owned has needed to be rebooted from time to time. I will often read about people having weird problems..like their new phone won't connect or something, and it turns out to be other brands of routers, meanwhile my Apple router just works with whatever I throw at it. I can even check on it and configure things from an app on my iPad. So easy. Truly one of the best and most underrated products they make. So glad I got it. Worth every penny. One thing I would love to see is iCloud caching with Time Capsule. It seems so silly to get home with 300MB of photos and have to have them all upload to the cloud, then download them again to my iPad and Mac. There should only have to be ONE upload to the cloud, then the data should be distributed on the local network to save bandwidth.